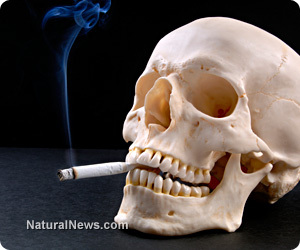 (NaturalNews) Americans for decades have known that smoking cigarettes (and, to a lesser extent cigars and pipes) can be a health-robbing, life-shortening endeavor. But a new report indicates that smoking can be even more dangerous than previously thought, and a lot of that most likely has to do with the toxic additives contained in tobacco. According to The New York Times, a recent review of available scientific literature on smoking by the acting U.S. surgeon general, Dr. Boris D. Lushniak, concluded that smoking, which has long been associated with causing lung cancer and heart disease, also causes a host of other ailments, such as colorectal and liver cancers, as well as diabetes, erectile dysfunction and ectopic pregnancies. The other health problems the report names are vision loss, tuberculosis, rheumatoid arthritis, impaired immune function and cleft palates in children of women who smoke. Doctors have, for decades, advised pregnant women not to smoke, but scores still do. The report notes that, while smoking has long been associated with these illnesses, this is the first time the federal government has determined that they are directly linked to smoking. The surgeon general goes on to say that his findings do not mean that smoking causes all of the health problems noted in the report, but he makes clear that, in at least some cases, the ailments occurred as a result of smoking. Bladder cancer (1990) and cervical cancer (2004) have been added by past U.S. surgeon generals. While the report carries no legal weight and is not binding in any way, it is nonetheless considered a standard for scientific evidence among policymakers and researchers alike, the Times noted. Experts not involved in writing the report said the findings were a comprehensive summary of the most current scientific evidence, and while they might not be surprising to researchers, they were intended to inform the public as well as doctors and other medical professionals about the newest proven risks of smoking. "I thought the science was very well done and up to date," Dr. Robert Wallace, a professor of epidemiology and internal medicine at the University of Iowa who helped review the report, told the paper. The report comes a half-century after a key 1964 surgeon general report in which the federal government, for the first time, determined that smoking causes lung cancer. That particular report was hailed as a starting point in changing public opinion about smoking in general; opinion on smoking has steadily soured in the U.S. since. In fact, in 1965 about 43 percent of adults smoked; in 2012, that figure had fallen to about 18 percent. According to the Centers for Disease Control, that amounts to about 43 million people. And, CDC says, smoking is the leading cause of preventable death in the U.S. The demographics of smokers tell a lot as well. For instance, the vast majority of smokers have only a high school degree or a GED and live below the poverty line, according to CDC figures. What's more, the Times added, the surgeon general's report found that the decline in smoking has been slowing in recent years, so he is calling for renewed and stronger action to combat smoking. While many major cities ban smoking in public establishments, some politicians want to raise tobacco taxes as a way to curb its use - though the latter has had little effect, according to the National Bureau of Economic Research. In 1994, the tobacco companies were forced by the federal government to reveal the additives they used in the manufacture of their products. The disclosure was stunning: Over the years, the U.S. government itself had approved no less than 599 additives for use in tobacco products. "While these ingredients are approved as additives for foods, they were not tested by burning them, and it is the burning of many of these substances which changes their properties, often for the worse," writes Terry Martin, an About.com expert. "Over 4000 chemical compounds are created by burning a cigarette, many of which are toxic and/or carcinogenic."